Let today be potty time with this Smiley Face Toddler Toilet Training Potty Seat! 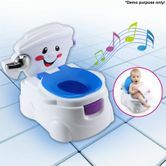 This toilet training seat provides realistic toilet elements mixed with fun and encouragement for your budding baby. 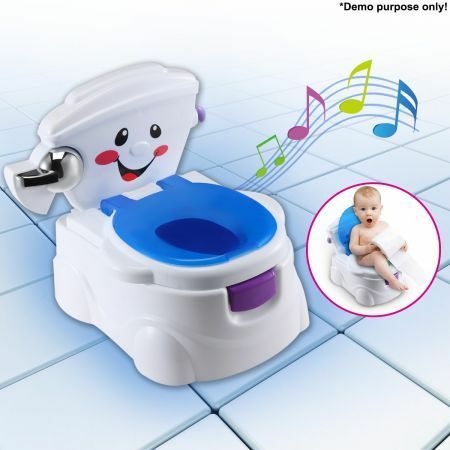 Your child will appreciate the realistic shape of the toilet along with the retractable bath tissue holder to help make them feel all grown up. And it makes for an easy, mess-free cleanup, too! The potty seat features a removable bowl & a smooth surface to help reduce the chance for buildup or minor messes. The toddler potty includes a lid-down feature plus a splash guard shield offering splash protection for boys. With two stages of use, you can arrange the full potty onto the floor for beginning toilet training and as your child transitions, the potty allows for the seat & lid to be removed and snapped onto the adult seat! There’s no reason for toilet training to be a nightmare – for you or for your baby. And a toilet training seat like this makes the transition fun & easy for everyone! Very quick delivery. Easy to put together and works a treat. Struggled to get my 2 year old on the toilet now I cant get him off it. Seller was communicative and prompt in addressing my query.